*^~#Private and ABN buyers only. Not available with other offers. PLATE BONUS only available on 2018 plate Demonstrator vehicles and redeemed at point of sale for selected vehicles purchased and delivered between 01.04.19 and 30.04.19. Only while stocks last. ^5 YEAR UNLIMITED KM WARRANTY from date of registration on demonstrator vehicles registered on or after 1 July 2018. Our goods come with guarantees that cannot be excluded under the Australian Consumer Law. You are entitled to a replacement or refund for a major failure and compensation for any other reasonably foreseeable loss or damage. You are also entitled to have the goods repaired or replaced if the goods fail to be of acceptable quality and the failure does not amount to a major failure. ~FREE SCHEDULED SERVICING applies up to 4 standard scheduled services, as specified by the Service Warranty Booklet, restrictions apply. Must service within 3,000kms or 90 days of scheduled service date, whichever occurs first. (a) $24,990 Drive away campaign price applies to 2018 RX 4x2 Single Cab Demonstrator 2WD model only. ABN Holders sold and delivered before 30.04.19 unless changed or while stocks last. DRIVEAWAY PRICING includes dealer delivery, stamp duty, 12 months registration and CTP insurance. Excludes prestige paint. (b) $37,990 Drive away campaign price applies to 2018 SL 4x4 Silverline Double Cab Demonstrator model only. ABN Holders sold and delivered before 30.04.19 unless changed or while stocks last. DRIVEAWAY PRICING includes dealer delivery, stamp duty, 12 months registration and CTP insurance. Excludes prestige paint. 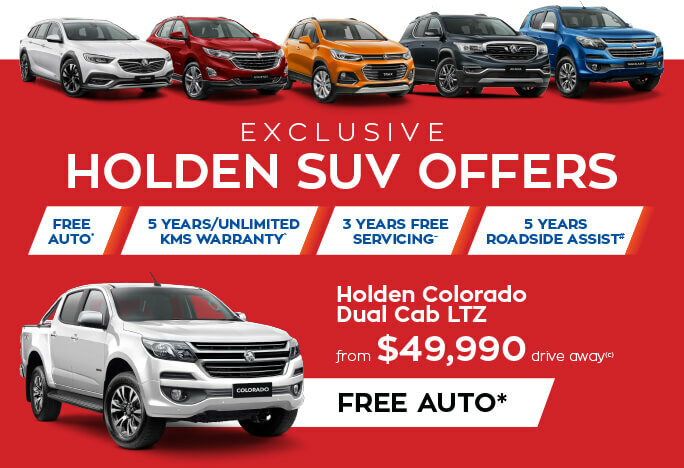 (c) $49,990 Drive away campaign price applies to 4x4 LTZ Dual Cab Colorado model only sold and delivered before 30.04.19 unless changed or while stocks last. DRIVEAWAY PRICING includes dealer delivery, stamp duty, balance of 12 months registration and CTP insurance. Excludes prestige paint. 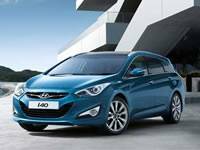 (d) $20,990 Drive away campaign price applies to i30 Go 2.0L Petrol 6-Speed Automatic 2WD Demonstrator model only sold and delivered before 30.04.19 unless changed or while stocks last. DRIVEAWAY PRICING includes dealer delivery, stamp duty, balance of 12 months registration and CTP insurance. Excludes prestige paint. (e) $39,990 Drive away campaign price applies to 2018 iLoad 2.5 CRDi (Diesel) Manual Van Liftback 2WD model only. ABN Holders sold and delivered before 30.04.19 unless changed or while stocks last. DRIVEAWAY PRICING includes dealer delivery, stamp duty, 12 months registration and CTP insurance. Excludes prestige paint. +Finance to approved ABN Holders (excluding government, fleet and rental buyers) only on a Goods Loan or Hire Purchase. Finance offer applies to 2019 production iLoad Models with a maximum finance term of 4 years and minimum 20% deposit. Finance applications must be approved by 30.04.19. and settled by 30th April 2019. Credit criteria, fees, charges and terms and conditions apply. 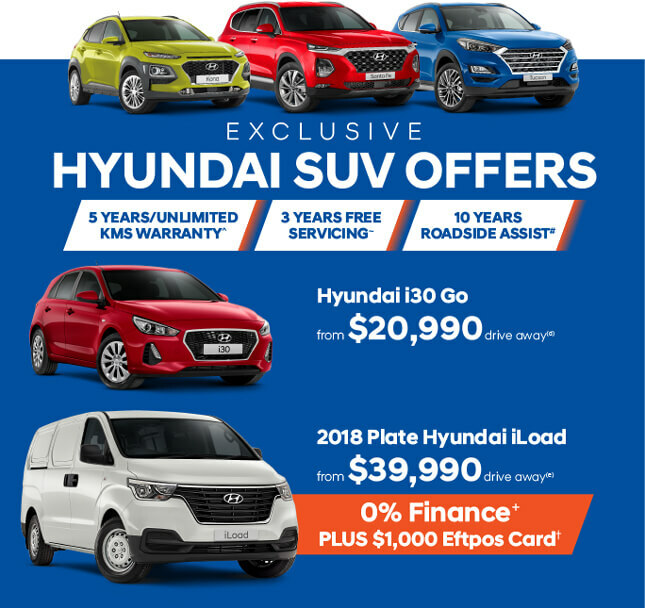 Hyundai Finance is a registered trademark of Hyundai Motor Company and is operated under licence by St. George Bank – A Division of Westpac Banking Corporation ABN 33 007 457 141 AFSL and Australian Credit Licence 233714. 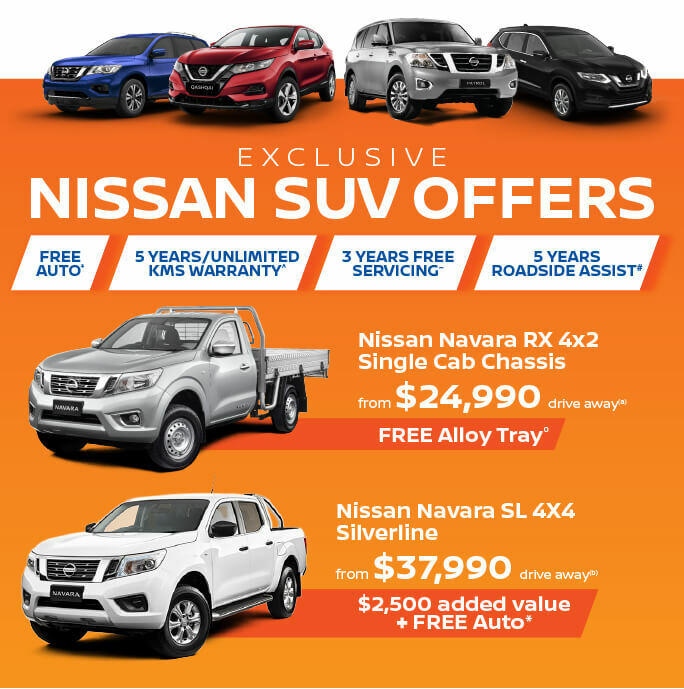 Offer valid whilst stocks last and excludes govt, fleet and rental buyers. Hyundai reserves the right to change, supersede or extend these offers at its discretion. Metallic and Mica paint are optional extras and are an additional cost. See your participating Hyundai dealer for details.